Inventory We are a resale marketplace, not a box office or venue. Ticket prices may exceed face value. This site is not owned by FirstEnergy Stadium . FirstEnergy Stadium, formerly Cleveland Browns Stadium, has long been a staple of Northern Ohio. Home to the National Football League's Cleveland Browns the aptly named Cleveland Browns Stadium has been torn down and rebuilt after the departure of the original Cleveland Browns to Baltimore. Since 1999 FirstEnergy Stadium have consistently sold out the 73,200 seats for every home game. With a new coach and some new faces the Cleveland Browns look as though they are on the up swing. This should give plenty for the famous 11,000 seats in the east endzone known as the Dawg Pound. Division rivals For the Cleveland Browns That visit every year are the Pittsburgh Steelers, The Cincinnati Bengals, and the Baltimore Ravens. 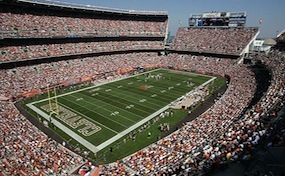 When it is not football season Cleveland Browns Stadium will host soccer games, and concerts. The one consistent concert every summer is sponsored by Macy\'s. FirstEnergy.StadiumCleveland.com is an independently owned and operated company that specializes in providing our customers with low prices and a large inventory selection in the secondary market. We are not currently affiliated with any official website, venue, box office, or primary supplier. Tickets can be below or above face value and will change with market conditions. To order tickets to all FirstEnergy Stadium events simply call our operators at anytime or follow the steps through checkout online.